By now you've probably heard about our new baby fur seal. He was rescued several months ago from a California beach, underweight, blind in one eye with a patchy coat of fur that couldn't keep him warm. After a fun and successful naming contest, this little guy was named Leu for the Aleutian Islands off Alaska, where Northern fur seals are found in the wild. 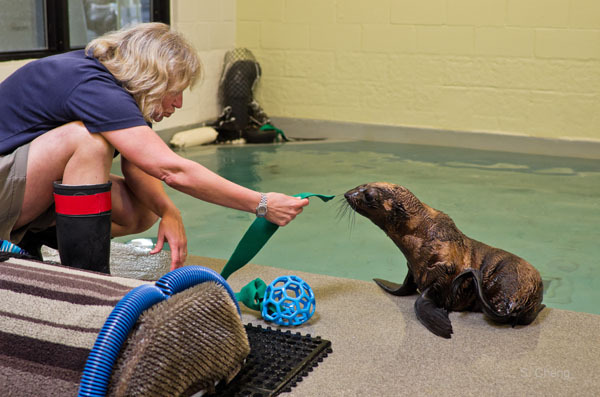 Leu has been charming and delighting the marine mammal trainers behind the scenes as he settles into life at the Aquarium. [Learn how the sea lions settled when they first at the Aquarium here.] He has been eating well and is getting stronger stronger every day. In fact, he's even found time to play! Play is a a great way to get your muscles moving and have fun in the process. Just look, little Leu is getting a really fun work out! Leu is still behind the scenes for his routine quarantine period, but you'll be able to meet him and watch him play this summer. In the meantime, you can definitely watch our young California sea lions frisking about the New Balance Foundation Marine Mammal Center. They love to play in a spray of water, juggle a soccer ball, slip and slide and practice new skills.